The Murchison Mountains are home to the last remaining wild population of takahē. Lost, presumed extinct, the remote alpine tussock basins of the Murchison Mountains on the western side of Lake Te Anau hid the takahē for 50 years until their rediscovery in 1948. Following the rediscovery, the Murchison Mountains were declared a 'takahē special area', off limits to all except a few scientists and deer cullers. For 65 years takahē conservation focused on boosting the wild population in the Murchison Mountain as the means of saving takahē from extinction. 'Excess' fertile eggs were gathered from wild takahē nests and taken to Burwood Takahē Centre where they were artificially incubated and chicks hand-reared. Captive reared takahē were either returned to the Murchison Mountains or were used to establish island 'insurance' populations. Eggs are no longer gathered from the Murchison Mountains. 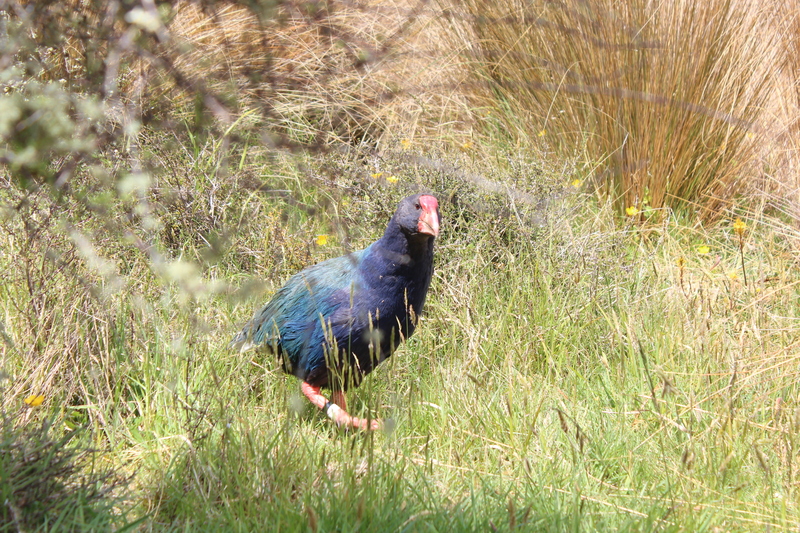 However now that the secure population of takahē has been established across the takahē sanctuaries, the Recovery Programme has again been able to supplement the wild population with birds. Since 2015 nearly 60 takahē have been released into the wild mountain population, which is a clear indication of the success of the takahē breeding. Small annual releases of birds are planned for the coming years to encourage population growth. Life is tough in the takahē's alpine home, but by 2007, things were looking up. The population in the Murchison Mountains had almost reached 200 birds when disaster struck. Following a beech and tussock mast (a mass seeding of beech trees and tussocks which happens every few years), the mountains were besieged by a plague of stoats. Within the span of a few months the wild population of takahē was halved. Fortunately by this time, takahē populations had been established on several island takahē sanctuaries to provide insurance against just this sort of disaster. Following the 2007 stoat plague trapping was extended from a trial area of 15,000 hectares to cover the entire 50,000 hectare Murchison Mountains Specially Protected Takahē Area. Trapping continues to be refined to improve the protection to takahē and other species. Trapping effort has been intensified by reducing the spaces between traps along trap lines, increasing the number of trap lines and increasing the frequency of trap checks. Currently 2500 traps are checked, cleared and re-set every 3 months. Deer and takahē browse on the same tussock species in the Murchison Mountains. If left unchecked, the impact of high numbers of deer browsing can retard tussock growth and restrict the food and habitat available to takahē. In the 1970's intensive deer control was introduced including helicopter hunting and the use of deer capture pens. Today deer control is undertaken by two commercial helicopter hunting operators. Over the past 6 weeks the Te Anau based Takahē Recovery Rangers have been walking alpine tussock areas in search of the wild takahē population of the Murchison Mountains.